Sometimes the simplest of approaches can yield some of the most compelling work. The combination of digital data and a plethora of different software tools with which to manipulate it makes the job relatively easy. To create something that makes people sit up and take notice still requires an idea; throwing data into your favourite software tool doesn’t result in a beautiful product by default. Here, Charley Glynn has used a dataset of lower order roads in the London area and simply rendered them with a light line weight and a neon turquoise colour on a black background. The effect gives us not only an impression of the density of the road network but also of an electrical storm with shafts of bright light emerging fractured from the centre of the image. The density creates a natural central bright spot but it’s also easy to pick out the River Thames, major parks and also the major routes in and out of the city which have been left black. Simple idea. Well executed and resulting in an evocative, crisp image of London that we rarely see in more mainstream products. It’s data art in map form. 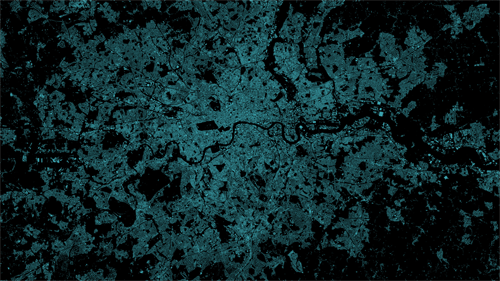 This entry was posted in MapCarte and tagged art, data art, map carte by @kennethfield. Bookmark the permalink.